MyNetDiary online and mobile diet program helps you lose weight by tracking your food calories with the best nutrition database in the world. MyNetDiary can also keep track and estimate your activity calories based on activity type and duration. Fitbit tracker uses an accelerometer and other sensors to estimate your daily calories burn, while Fitbit weight scale can automate your weight tracking. MyNetDiary shows the activity calories, daily step count, body weight, sleep hours and average heart rate as measured by Fitbit. Fitbit shows your food calories and nutrients tracked by MyNetDiary. MyNetDiary also sends body weight measurements to Fitbit. Using Fitbit with MyNetDiary helps to calculate daily calorie balance more accurately, see the actual balance of the calories you burn and eat during the day, and ultimately - helps you lose weight faster and smarter! 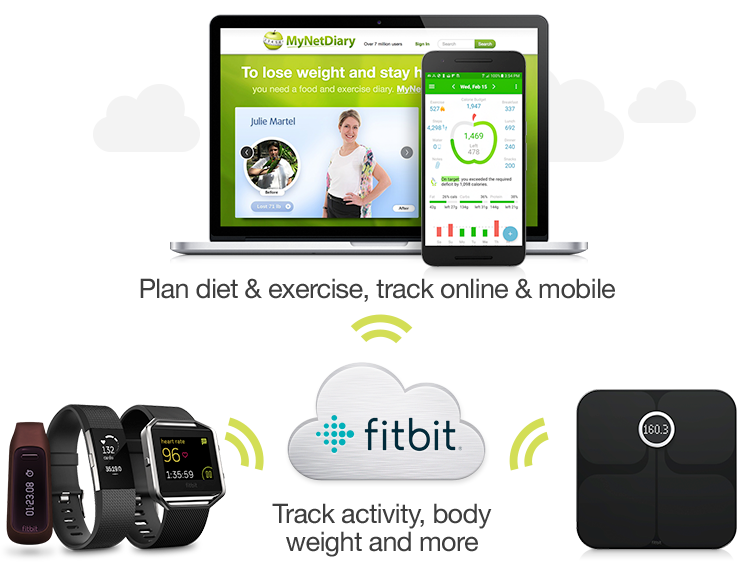 We highly recommend using Fitbit for activity and weight tracking, while you use MyNetDiary to improve your diet and lose weight. Daily foods - including food name, calories, fat, fiber, carbs, sodium and protein content. 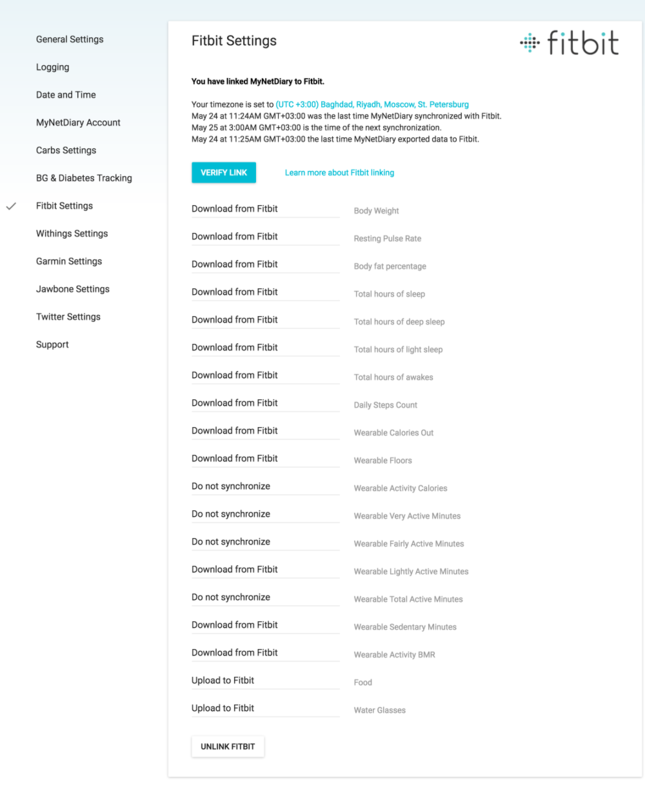 You can choose which data can be downloaded from (and uploaded to) Fitbit. Use Fitbit Settings page. First of all, make sure you Sign Up for MyNetDiary Maximum or Upgrade to MyNetDiary Maximum. Fitbit linking and many other premium MyNetDiary features are available with MyNetDiary Maximum. Please set up your Fitbit account and device as explained at Fitbit website. Before going further, please verify that your Fitbit account is set up correctly: on the Fitbit website, go to the Activities tab and check if you see the calories and other information uploaded from your Fitbit device. On the MyNetDiary website go to the Account tab, then click on the Fitbit Settings section. Click “Link to Fitbit” button. You will be redirected to the Fitbit website. What happens after I link? After you link to Fitbit, MyNetDiary performs automatic data exchange within several minutes after you enter foods in MyNetDiary, one exchange per hour. If you don't log foods for some day, MyNetDiary will download your Fitbit data during the night. 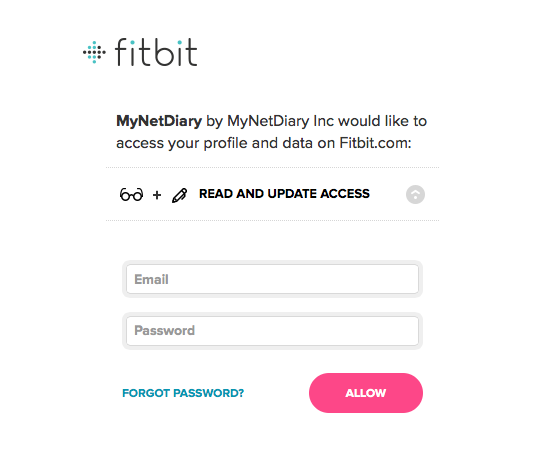 In the case you do not log foods in MyNetDiary for 5 contiguous days, MyNetDiary stops exchanging your data with Fitbit. When you resume logging foods, MyNetDiary resumes Fitbit data exchanges. If you want to expedite exchange of today's data, go to Account/Fitbit Settings page and click "Verify link" button. MyNetDiary exchanges last 2 days of data after the link is established or restored. When you sync Fitbit trackers to the Fitbit website, MyNetDiary receives notification from Fitbit within several minutes and automatically downloads new data. If Fitbit total calories are less than Weight Maintenance Calories, Fitbit exercise is set to zero because negative exercise cannot be used by MyNetDiary planning and analysis features. Make sure you have chosen the same timezone in MyNetDiary and Fitbit, also make sure your body weight, gender and date of birth settings are the same in both systems. We recommend setting MyNetDiary Activity Level to Sedentary, because "Fitbit exercise" includes only calories above your activity level, so Sedentary level in MyNetDiary gives you the most "Fitbit exercise" calories. In addition to exercise calories, Fitbit tracker counts daily step count and may determine hours of sleep. Fitbit Aria scale measures body weight and body fat percentage. MyNetDiary downloads all these measurements from Fitbit. To see the downloaded measurements in MyNetDiary, go to MyNetDiary Daily Details page and click “Select Measurements to Track” link. In the case you would like to repeat Fitbit download for the last 2 days, please use the "Verify Link" button.